The Hamstead cross body bag is made of full grain cowhide leather with soft hand feel, leather that gets better-and better-over time. This vintage purse is designed to be practical yet stylish enough for the modern woman. Need the convenience of a cross body bag but the storage capacity of a regular bag? The Hamstead cross body bag is here to save the day. 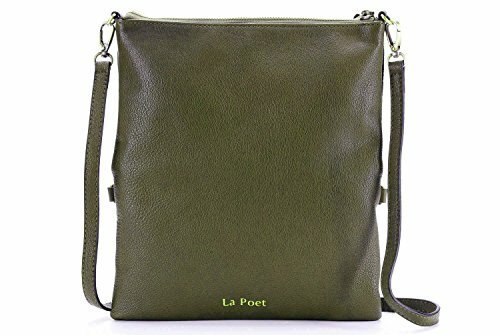 This stylish fold-over design cross body has so many pockets you won't know what to fill it with. Your everyday essentials will stay in tip-top condition and organized for your I-pad, a large wallet, your phone, keys and a small cosmetics case. -just what you need to step out for the day. Wear it casually during the day or dress it up for a night out. And bonus; the strap is removable; meaning that you can carry it as a cool; fold-over clutch if you aren't in the crossbody/shoulder bag kind of mood. The adjustable leather cross body strap sits comfortably on your shoulder. This Hamstead's fold-over zippered top cross body bag get moving-it carries all you need for your next adventure. If you have any questions about this product by La Poet, contact us by completing and submitting the form below. If you are looking for a specif part number, please include it with your message.